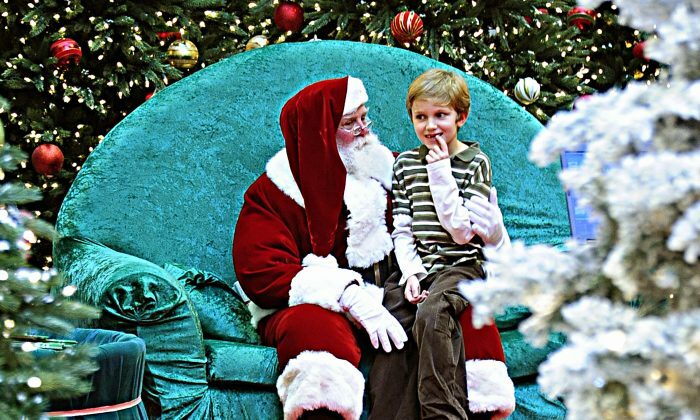 An unexpectedly large fee for sitting on Santa’s lap at a New Jersey mall has parents upset. Cherry Hill Mall is charging children $35 to visit with Santa and get pictures taken with him. For $50, a video of the visit will be recorded for parents. Parents are upset also about the fact that Santa is cloistered inside a building referred to as the North Pole headquarters, with no means of seeing inside. You better not cry. You better not pout. And, if you want to see Santa at the Cherry Hill Mall, you better have at least $35. She had considered taking her children for an impromptu visit to Santa while at the mall shopping on Sunday, but balked when she saw the price. “I think it’s outrageous,” she said. Other parents voiced their opinion online on the mall’s Facebook page. “SHAME ON YOU for charging too much money for a child to see Santa,” said one. “CHARGING parents $35 to visit with Santa Claus? Upscale shouldn’t mean elitist—whoever made this decision should hang his/her head in shame…DISGUSTING,” said another. Most malls allow children to see Santa for free, but make money by offering photo and video services if parents want higher quality memories of the trip. The set-up at Cherry Hill last winter was free. The Pennsylvania Real Estate Investment Trust, which manages the mall, noted that the exhibit is unique and includes a 15- to 20-minute experience that includes characters from Shrek movies and a simulated sleigh ride. “Families who experienced this exciting amenity last year commented that it was nothing like any Santa visit they had ever had before, and parents were thrilled with not just the adventure but the quality of the photos as well,” the statement said.